You may follow all my creating art and teaching adventures on my instagram and facebook page - and you'll get the idea of how blessed I'm feeling. Not so long ago I had the chance to finally meet in person one very special Lady - super talented - my Creative Team member - my Friend in Art - Linda Cain ! And here's the proof. :) Am I lucky or what?! And today we have Linda presenting a new one among her stunning artworks. Enjoy! Hi everyone! Linda here, and I’m back to share a vintage project with you that I loved making. It’s small, but packed with ephemera that will have you looking closely to see the details. 1. I’m using a small shrine for this, but you can apply this idea to many different objects. I like to lay things out and get some idea of the project. The Mechanical flower at the top is trimmed with shears removing 2 sections. The other pieces will be the bottom section. 2. I painted the shrine and several Mechanicals with Heavy White Gesso so they will take paints and inks. I left the leaves and top section unpainted for contrast. 3. These pieces were painted and put together with 3 tiny brads. Sand off and polish the “CREATE” plate to expose the word. 4. This laser-cut shrine comes flat, so I added vintage German-English dictionary pages to the inside sections with Soft Matte Gel. Then I sponged on Archival Inks to age even more and sealed with the same Gel. 5. The outsides were painted with acrylic paints using either a sponge paint dabber or foam square. 6. The text clearstamp “Messy” is used with black Archival Ink. Now glue the shrine together. When dry, I added Clear Crackle Texture Paste to areas that created an “aged” look to the surface. 7. This wooden candlestick is base-coated with Heavy White Gesso first and then a layer of White Crackle Paste is slathered on. When it's dry, add Archival Inks in orange and sepia and some wax patinas. 8. Assemble the shrine and add the Mechanicals with 3D Matte Gel. 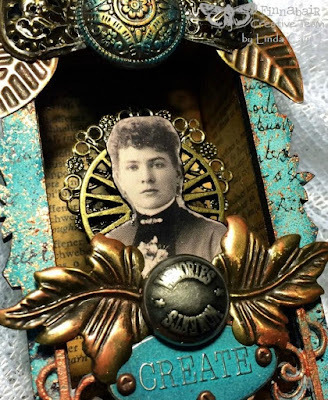 The Vintage Lady is glued to a small wooden block and two Mechanicals. Let it dry overnight. When it was completely dry, I added more Inka Gold waxes to areas creating more contrast. The candlestick was too bright for me, so I added a blue Patina wax and toned it down with more Archival Inks. 9. The finishing touches were to add some Gloss Gel with a brush to different places and sprinkle Copper, Silver and Black Micro Beads as filler. I also added some Gold Mica Flakes. The paper Flower was sprayed with several colors of ink, and Micro Beads, plus some Luminous Gold Glitter was added. A bit of Charcoal Art Sugar and black Micro Beads are layered around the candlestick rims. A black bow completes the base. 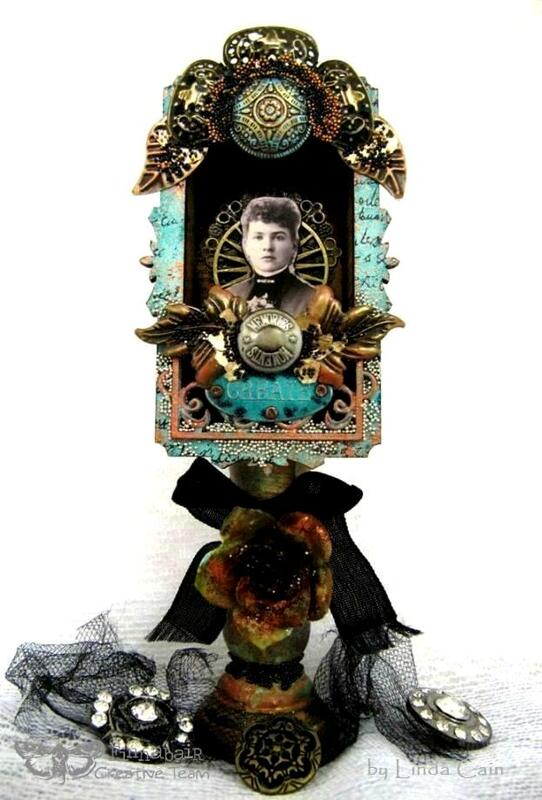 I hope you’ve enjoyed this project and found the inspiration to make an Assemblage of your own. You can use little gift boxes, jewelry boxes, mint tins, or make one using chipboard. The possibilities and the fun are endless!!! Such an amazing project!! I love the shrine itself. And the colors are perfect. Another project on my to do list - which is really lengthy! Your shrine is gorgeous! Fabulous! I have been a fan of Linda's for quite some time!! Linda - you always inspire! This is soooo FABULOUS. j. Love this Linda! I always enjoy your assemblages and the details are stupendous.